Time sure flies when you’re having fun, and we’ve had plenty of it over the past decade. 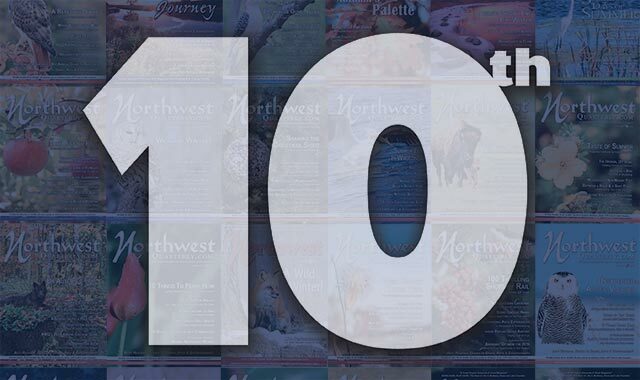 As we mark the occasion of our 10th anniversary in the northwest suburbs, we look back at the ways our magazine and our region have changed. If you had asked me 10 years ago where I saw myself today, you might have heard something about a big newsroom in a big city and all of the ways I’d be changing the world with the power of my pen. Call it the naïve dreams of a college student. I certainly never saw myself returning to northern Illinois or one day operating the magazine I was helping to launch during my summer internship in 2007. Today, I’m working in a small, but vibrant newsroom, and it’s one that’s producing stories of movers and shakers, businesses small and large across a 16-county swath of northern Illinois, southern Wisconsin and northwest Chicagoland. These are stories of inspiring accomplishments, interesting people and positive visions for what our region is and what it can become. We are making a positive impact. For the past decade, Northwest Quarterly has had the privilege of sharing the stories of the northwest Chicago suburbs. It’s no small task, when you consider we’re covering McHenry, Kane, western Lake and northwest Cook counties – in addition to DuPage, DeKalb, and Walworth counties. From densely packed suburbs to wide-open lands, there’s no shortage of inspiration. Though we’ve been covering the suburbs for 10 years, Northwest Quarterly’s story begins a few years earlier, with an ambitious idea to help the greater Rockford area find its voice. It was 2004, and the city was in need of white knights. Decades of industrial exodus and self-inflicted wounds had left the community with a pervasive sense of despair. Yet, if you asked around, you’d find visionaries who dreamed of something better. Count Bill Hughes among them. A few decades earlier, he’d launched Rockford Magazine. Eventually, he sold it and moved on to trade publishing. By 2004, he was ready for a new challenge. Enter Northwest Quarterly. A skeleton crew, led by Bill, assembled that very first publication in late 2004, working between coffee shops and a small room in a loaned office. Those earliest issues took to heart the mission you’ll see on our business cards: “Publishers of relentlessly positive, uplifting and informative magazines.” Our mission has always been to change the narrative. Janine Pumilia, our faithful founding editor, likes to joke that she wasn’t looking for a summer intern when I showed up as a college student with a smile on my face, a resume in my hand and a quiet persistence that got me in the door. (Persistence alone is omnipotent, right?). That summer, I got a good taste of magazine publishing, writing and researching. I can still remember those little tasks I’d help with, as the team continued researching its new publication for the northwest suburbs. Who were important contact people? What were the major communities? What was on their minds? As a resident of Crystal Lake today, it’s easy to take for granted how daunting a task this must have been. But then, as now, it was a chance to explore new territory. And what’s more exciting than the thrill of a hunt? I may know a lot more about the suburbs now, but every day I’m finding new destinations to share with you. 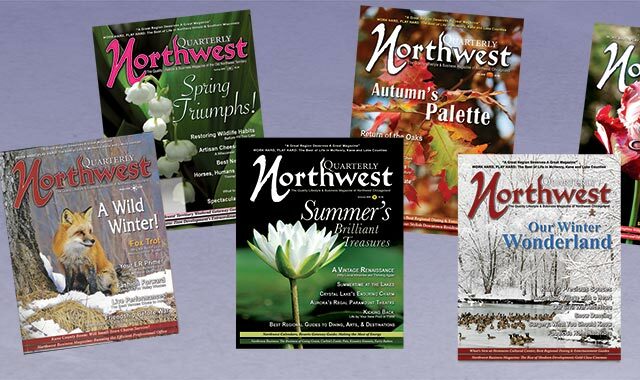 I was out of school and freelancing in 2009 when I returned to Northwest Quarterly. Beginning as an editorial assistant and web guru, I was soon handed more and larger stories, along with some new responsibilities. One day, I was handed me the reins of our suburban edition. Looking back on the past decade, it’s fun to see how our small team, our publication and our region have evolved. I can remember when Huntley Outlet Shops were the place to be, when we were talking exponential population growth and kitchen designers were all excited about these “new” soft-close door hinges. Over the years, we’ve seen many small, local businesses – our bread and butter, so to speak – come and go, and luckily, we’re seeing a lot more coming these days. Our staff has grown, too. A decade ago, we were a team of eight. There was Bill, our ever-faithful publisher; his wife Lisa, our office manager and surrogate mom; Janine, our editorial chief and mentor; Dustin Waller, our photographer and graphics chief; and a myriad of salespeople, many of whose last name ended in Hughes. We also counted on a modest stable of talented writers, many of whom are still a part of our team. Over the years, I’ve seen people come and go, and we’ve said adieu to some really talented teammates. Now 14 strong and ever younger, our staff still admires the tireless work and sage advice that Bill, Lisa and Janine provide. Our new managing editor, Lindsey Gapen, joined us in 2015 after graduating from University of Wisconsin-Madison. She’s a die-hard Badgers fan and has a knack for finding a gripping story. Our new assistant managing editor, Jermaine Pigee (pronounced pig-ee), joined us in 2016 after spending several years in the daily news business. He loves sports, has a big personality and always gets his story – no matter what it takes. The past decade has brought us through many changes. Though we call ourselves a “quarterly,” we now publish five times a year in Chicagoland, six in the Rockford area. And, our little team keeps busy updating our website and putting out a small weekly magazine in the greater Rockford market. We don’t know what the next decade might bring for Northwest Quarterly, but you can be sure that what won’t change is our positive vision for this region of the Midwest. This is the place we call home, and we do so willingly. We can’t imagine living anyplace else. It’s been a lot of fun discovering this suburban region, but really, the fun is only just beginning. We’re only 10 years young! So, here’s to 2018 and the dawn of an exciting new decade in our story – one we hope you’ll continue to share with us. Here, we look back at a few of our favorite stories and some of the major milestones we’ve seen. We’re just 10 years young and there’s plenty more to explore in the future! Winter 2008: How else do you inspire the Fox Valley than with a look at its namesake: The Return of the Red Fox. Winter 2008: A Visit to Kane County. A glimpse of this growing county, from lush farm fields to bustling cities. Spring 2008: Magnificent McHenry County. Tour the charming towns and open spaces of this place we call home. Spring 2008: Home Grown in Kane County. The growing demand in locally grown food is creating opportunities for farmers and growers in our region. Summer 2008: For the Love of Horses. A look at the unique partnerships that make Barrington Hills a horse haven. Summer 2008: Putting Heads in Beds. Why tourism is so important to our region, and how local visitors bureaus are attracting outside dollars. Fall 2008: How the Railroads Shaped our Region. And generated many of our hometowns. Fall 2008: Stylish Residential Redevelopment. Projects in Woodstock and Elgin showcase early examples of our urban renaissance. Winter 2009: Precious Spaces. As Kane County’s population continues exploding, conservation experts talk about an initiative to preserve open spaces. Spring 2009: Great Native Plants for Your Garden. Discover 15 native plants that are easy to maintain and come highly recommended. Spring 2009: Minimally Invasive Surgery. It was big news when surgeries could be accomplished with only small cuts. Summer 2009: Why Local Wineries are Thriving Again. Illinois’ wine industry is thriving on homegrown grapes and Midwestern personality. Summer 2009: The Business of Going Green. We catch up with five organizations leading the way in sustainable development. Fall 2009: Chicago Wilderness. We meet a consortium of more than 230 conservation organizations working to preserve Chicagoland’s natural heritage. Fall 2009: The Latest in Luxury Bathrooms. In an age of traditional country design, this story captures trends such as spa-like features, furniture-like cabinets and stone finishes. Winter 2009/10: Antiquing in the Fox River Valley. It’s fun to hunt for treasures, and we get the scoop from some of the area’s leading antiques experts. Winter 2009/10: Healthy Patients, Healthy Environment. Sustainability principles, evidenced by a 15-acre geothermal lake, shine at the new Sherman Hospital, in Elgin. Spring 2010: The Edible Garden. An inside look at what it takes to cultivate your own beautiful produce at home. Spring 2010: Poplar Creek at 59/90. As the economy recovers, local leaders launch a new vision for working, living and playing in the area around I-90 and Illinois 59. Summer 2010: Designers Share Their Kitchen Dreams. Luxurious ideas for the home, from entertainment kitchens and double islands to red birch cabinets and decorative hoods. Fall 2010: Flying High at Norge Ski Club. Fox River Grove’s ski jump club is a training ground for Olympic hopefuls. Fall 2010: The Underground Railroad. A look at local spots that helped runaway slaves escape to Canada. Winter 2011: Return of the Eagles. This distinctive symbol of our nation is a regular wintertime visitor. Winter 2011: Manufacturing: High Tech, Not ‘Dumb and Dirty.’ A new coalition of public and private leaders is preparing workers of the future. In Fall 2014, we learned about the group’s new high school internships. Winter 2011: Our fashion shoot flies high over Chicago at Hancock Tower. Spring 2011: Sustainability in Elgin. A look at how Elgin is reinventing itself into a more “green” and “sustainable” community. Spring 2011: Community Banks: Small but Mighty. The first of a yearlong series on what distinguishes locally owned banks from their much larger competitors. Summer/Fall 2011: Local Connections to the Civil War. Trace the steps of five soldiers. Summer/Fall 2011: Nothing Sly About this Fox. A source of sustenance, industrial power and recreation, the Fox River remains a powerful part of our region’s identity. Winter 2011/12: Our first Christmastime issue! Of course, we have to talk 12 Great Christmas Celebrations in our region. Winter 2011/12: Seizing Opportunity with Low Interest Rates. We review how mortgages are evolving since the recession. Spring 2012: The Mighty Giants. Looking back at Hebron’s remarkable state champion basketball team. Spring 2012: Higher Education and a Higher Calling. Forward-thinking Judson University is setting the stage for the future. Summer 2012: Dreamy Wedding Destinations. Our very first look at area wedding venues and couples who’ve celebrated their big days at these destinations. Summer 2012: No One Knows Woodstock Like Don Peasley. About a year before his death, we caught up with this beloved photographer. His desk is now on display at the McHenry County Historical Society. Fall 2012: In a Nutshell. We meet the family behind John B. Sanfililppo & Son, one of the world’s leading nut producers. You may also know their Place de la Musique estate. Fall 2012: Autumn Drive Celebrates 25 Years. The backstory of the Woodstock area’s beloved fall tradition – part garage sale, part art show and part farm market. Winter 2012/2013: A Tour of Stained Glass Windows. Beautiful when illuminated, these church windows tell the story of our faith and our history. Winter 2012/2013: Remembering the White City. More than 120 years after the World’s Columbian Exposition, you still can spot the local impact of Chicago’s first world’s fair … including Geneva’s Amazing Viking Ship, whose cross-Atlantic journey we chronicled in Spring 2013. Summer 2013: The Chain O’Lakes. These 15 lakes make up one of the busiest inland waterways in the U.S.
Summer 2013: Preparing for Tomorrow’s Jobs, Today. Digital design, mobile software development, zero-impact design and energy management jobs are in high demand. Fall 2013: Ghosts, Criminals & Urban Legends. Getting to the truth behind our region’s incredible tales of gangsters, criminals, ghosts and legends. Fall 2013: Lakeside Legacy Arts Park. Creative types around the region adore this ever-evolving sanctuary for the arts. Winter 2013/14: Saving Elgin’s Historic Neighborhoods. These dedicated residents are revitalizing Elgin’s inner core. Winter 2013/14: Top Challenges to Consider for 2014. Local finance and insurance experts share their predictions – many of which came true. Spring 2014: Geneva’s Green Market. This year-round market celebrates our local farmers and their small-scale harvests. Summer 2014: It’s a big year for anniversaries, as we mark Crystal Lake’s centennial, Gail Borden’s 140th birthday and Barrington’s sesquicentennial. Summer 2014: The Sport of Dressage. This equestrian sport looks simple, but it takes years of training for both horse and rider. Summer 2014: What High-End Homebuyers Want. As the real estate market picks up, we look at what’s driving the luxury properties market. Fall 2014: Fox Valley Brewers & Distillers. We catch up with four renegade souls riding a trend of craft brewing and distilling. Holiday 2014: America’s First Private Eye. Allan Pinkerton foiled assassination attempts, rooted out Confederate spies and protected Abraham Lincoln. Holiday 2014: We go all in for the holidays, highlighting Salvation Army bell ringing, a buy-local gift guide, holiday decorating tips and classic local Christmas festivals. Winter 2015: Arrival of the Owls. Nature photographer David Olson recalls how he captured a rare migration. Winter 2015: Barrington Students Jump into Entrepreneurship. Can you believe these inventive youngsters get school credit for starting new businesses? Spring 2015: Remembering Appomattox. Marking 150 years since the end of the Civil War, we review its impact on our region. Summer 2015: Return of the Bison. For the first time in almost 200 years, wild bison roam east of the Mississippi. Summer 2015: Keepin’ it Country at the County Fair. The rural lifestyle is still alive and well in our region. Fall 2015: Football Fandom at Cary-Grove. Inside the early season preparations for this perennial football powerhouse. The team finished with an impressive 11-2 record. Fall 2015: Luxury Rules in Transitional Design. The latest craze in home design, transitional mixes contemporary cleanliness with traditional trims and textures. Holiday 2015: Cautious Optimism Rules in 2016. Local Chambers of Commerce share their hopes and fears for the coming year – which turned out to be a banner 12 months. Spring 2016: MasterCraft Boats of Chicago. Part boat dealer, part manufacturer, this organization is a testament to the results of hard work and innovative thinking. Summer 2016: Building’s Abuzz in Elgin. As a wave of new building happens, we look at the inside forces driving this trend. Fall 2016: Inside Fermilab. New discoveries about the universe continue to happen at this amazing physics laboratory in Batavia. Fall 2016: How to Build a New Hospital. We learn from Centegra Health System what it takes to open a new hospital in Huntley. Holiday 2016: Woodstock’s Midwestern Charm. The Square is a strong reminder of this town’s history and its cultural heritage. Holiday 2016: Barrington Children’s Choir. Three decades into its journey, this group is singing sweet notes. Winter 2017: Inside the World of Community Radio. Turn to a low-power FM radio station and you’ll hear the stories of your own neighborhood. Winter 2017: Assessing Elite Athletes. Step inside Gatorade’s R&D facility in Barrington to see how science meets sports nutrition. Spring 2017: TLS Veterans. Meet a McHenry County group that’s assisting veterans through challenging times. Spring 2017: Beyond Barrington. What’s in a name? For Barrington’s neighbors, it’s an identity of strong community, open spaces and relaxed lifestyles. Summer 2017: When we Bought Homes from a Catalog. We find a collection of Sears mail-order homes in Geneva. Summer 2017: 14 Hometown Festivals. What better way to celebrate summer than with these classic festivals that bring out the best of our region? Fall 2017: Golden Anniversary for McHenry County College. The tools and technologies of education have changed, but this institution’s dedication to learning hasn’t. Fall 2017: Life on a Centennial Farm. Family farms remain a treasured institution in our region. We meet a family that’s been working the same land for 160 years. Holiday 2017: More than Horsin’ Around at Main Stay. It’s no small thing when these animal lovers say they have a way of changing lives through animal-assisted therapies. Holiday 2017: Serving Others at the Holidays. Volunteering during the holidays is a meaningful way for many to share Christmas cheer. This entry was posted on Tuesday, January 9th, 2018 at 12:00 pm	and is filed under Features, Top Posts. You can follow any responses to this entry through the RSS 2.0 feed. Both comments and pings are currently closed.